Adagumo no Yaorochi (徒雲　八尾呂智) is an aloof expressionless person who is a youkai born from Orochi's arm. They have an obsession with the sword Tasouken, the legendary Sword of Kusanagi. They're the final boss of Earthen Miraculous Sword and a playable character in Reactivate Majestical Imperial, the second and third game of the Len'en Project respectively. At first glance, Yaorochi is aloof, composed, and dignified. But to those who know them better, Yaorochi is actually simpleminded, violent, quick to anger and pathologically obsessed with the Tasouken. Their personality is indifferent to others, and because they ostracized themselves for so long, Yaorochi is a loner by nature and chooses not to socialize. They're hostile towards humans and look down on them, but if they have to cooperate with them, they acquiesce. In speech, they speak with an archaic Japanese language, all the while using a belligerent and haughty tone. Because they were born from Orochi's arm, they have an attachment to the Tasouken. They love the sword more than anything else, even to the point of idealizing for its return to splendour. They want it to be as magnificent as it was in the ancient times. When they were born, they executed those who killed Orochi's clan in vengeance, as they felt they had an obligation for it. After they found what was left of the Tasouken, they understood that they never wanted the sword in order to exact revenge or to revive the old clan. It was simply because they were attached to it. They're shown to be manipulative and cunning (such as manipulating Sukune Katano to restore the sword) and will attack any person who gets in the way of themselves and the Tasouken. For instance, cutting down Adagumo no Saragimaru in the past and attacking the heroes in Earthen Miraculous Sword, because restoring the Tasouken brought cloudy weather to Mugenri. Being born from the arm of Orochi gives them natural swordsmanship. Because of their connection to the Tasouken and its ability to sever relationships, Yaorochi's sword's ability is defined in such a broad manner. The leader of a powerful clan (implied to be Yamata no Orochi) was betrayed and killed by other enemy clans and his body was dispersed in eight fragments. Yaorochi was born from his severed arm, and because of it, they have an attachment to the clan's legendary sword, Tasouken. Yaorochi and their seven siblings decided to get revenge on Orochi's murderers, but most of them died before achieving their goal. Yaorochi was very cold and distant to their younger siblings and for some reason they never got particularly well with the youngest, Adagumo no Saragimaru. It eventually escalated to violence which culminated with Yaorochi cutting Saragimaru down. Given the nature of the Tasouken, their bond shattered and they distanced. Shortly, Yaorochi abandoned them in order to look for the sword. Yaorochi looked for centuries for the lost Tasouken and was very disappointed when they found that it was all old and rusted. They were so disappointed and heartbroken that they isolated themselves for years. One day, they travelled to Mugenri and they saw a clay sword that greatly resembled the Tasouken. They convinced the creator of the clay sword, Sukune Katano, into transferring the essence of the Tasouken into the clay sword. In order to transfer it, they required a "vessel". And so as a place to perform the ritual Yaorochi had Sukune prepare a huge clay "vessel". Yaorochi pulled the sword out from storage. They thrust the sword along with the clay sword into the ground, and began the ritual. They began the power transference, and the rusted sword crumbled into dust in an instant. Outside, the sky was enveloped by gathering clouds, causing the events of Earthen Miraculous Sword. Their full name is Adagumo no Yaorochi (徒雲　八尾呂智). Their given name Yaorochi (八尾呂智), spelt to mean "eight tail bone knowledge", is based on the name of Yamata no Orochi. Their surname, Adagumo (徒雲), means "vanishing cloud". It refers to the concept of ephemerality, giving the impression of a cloud that disappears as soon as you reach out to touch it. The hiragana character no (の) used here indicates a "belonging", thus the English equivalent of their name would be "Yaorochi of the Adagumo". In ancient Japan times, it was common for aristocrats with a clan's name to have no between their clan's name and first name. Yaorochi is of moderate height. They have long black hair tied in a side ponytail. 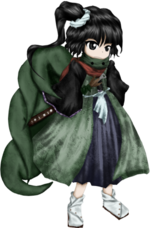 They wear a green scarf with snake designs, a black and purple hakama with floral patterns and a pair of black detached sleeves. As an orochi, they have seven tails. Sukune Katano was tricked by Yaorochi into transferring the essence of the Tasouken into a clay sword, but said process made the weather in Mugenri very cloudy. Still resenting humans for murdering Orochi's clan and separating them from their sword, they attack the heroes when they arrive to stop Yaorochi. However, after Yaorochi is defeated, the Tasouken attacks on its own because the essence of the Tasouken was too strong for the clay vessel. After everything was cleared, Sukune reveals to them that the back of the sword acts as a bottle opener. The orochi was devastated at first, but in the end they decided that they didn't mind at all because they had the sword in their possession after centuries and it was all that mattered to them. There is a long winter out of season and there's a sudden flow of spirits. This bothers Yaorochi, who is unable to hibernate. They and Sukune go to the Senri Shrine for answers, but after finding nothing, they decide which team will resolve the incident. Yaorochi is angry at everyone's lack of initiative, although they mostly want to resolve the incident in order to put their Tasouken to use. After dealing with a few youkai in search for answers, they find Taira no Fumikado, who was trying to collect spirits for their resurrection ceremony, since they want to resuscitate the vengeful spirit Taira no Masakado and store him in their homunculus body. After defeating them, they find out that all the spirits are attracted to a certain location. Finally, they end up in the Withered Grove, where they find the chimera soul Shion, who is the avatar of the soul-eater flower Harujion and was absorbing spirits causing a long winter. Sukune realizes that the heroes were supposed to uproot the Harujion before it bloomed, but since the priest Tsurubami Senri is in the Outside World, it has bloomed. Deciding to do the right thing, Sukune and Yaorocho fight them in a duel. In the end, Yaorochi and Sukune arrive at the Senri Shrine, bringing Shion with them. Shion indicated that they were attracted by the essence of the shrine. Angry at Yabusame Houlen and Tsubakura Enraku for staying at home rather than resolving the incident, Yaorochi scolds them, but it goes on deaf ears. It's revealed that the spirits came to Mugenri because of a hole in the Mugenri Barrier that separates the land from the Outside World. The hole was caused by Lumen, during the Clouds Incident and Tenkai Zuifeng was tasked to repair the hole, but is taking too long. Angry for putting Mugenri at risk, Yaorochi and Sukune go to chastise Tenkai. After finding out that Tenkai is actually an apprentice, Yaorochi mocks them, only for Tenkai to remind them about the failed Tasouken ritual. On the way back home, they are ambushed by Sese Kitsugai, a youkai they had defeated at the beginning of the story. Sese absorbs the spirits the heroes had been recollecting. After Sese is defeated, the spirits leave Sese's body. Sese still hasn't given up on their dreams to become stronger, so Yaorochi offers to be their sparring partner anytime. Now living at Sukune's house, Yaorochi isn't interested about the upcoming war and decides to stay out of it, hiding at the Ritual Chamber in Sukune's house. Both the Imperial Military and the Dragonfly Army have heard about the Tasouken's immense power and want to recruit Yaorochi because of it. Meanwhile, Yaorochi is paranoid that everyone will try to take their sword away from them, so they're attacking intruders that come across the chamber. During the events of Earthen Miraculous Sword, Yaorochi manipulated Sukune Katano into transferring the essence of the Tasouken into a clay sword (requested by Saragimaru to make Yaorochi happy) by posing as a holy servant. Despite caring about nothing but the sword and willing to hurt and manipulate people for its sake, Yaorochi did feel guilt about using Sukune. Even after discovering that Sukune revealed that said clay sword was actually a bottle opener, the two became good friends and Yaorochi forgave Sukune for the misunderstanding. 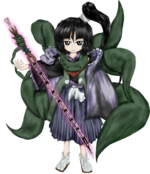 Yaorochi is a loner by nature who despises humans and weak youkai, but is friends with Sukune and after the clouds incident, both live together at Sukune's house. Despite Yaorochi's immense power, dialogue with Yabusame imply that Sukune is the more dominant in their relationship and Yaorochi acts mild towards the haniwa. 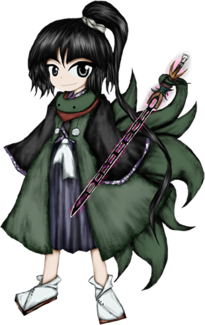 Adagumo no Saragimaru is Yaorochi's little sibling. In the past, they had a fickle relationship and they distanced when Yaorochi abandoned their siblings in order to find the lost Tasouken. Saragimaru has not forgotten their older sibling and secretly watches them from afar. Yaorochi is too fixated on the Tasouken and has already forgotten about them and the rest of their (now deceased) siblings. According to JynX, Yaorochi sometimes wonders what happened with their remaining siblings and they have started to notice that someone frequently looks after them. Like many other, Yaorochi doesn't really think Tsubakura and Yabusame are doing their job as Senri Shrine priests, by being inclined towards doing things as they please instead of doing it the traditional way. Despite antagonizing them a few times, Yaorochi is still in cordial terms with Tsubakura and Yabusame and visits them at the Senri Shrine. Even so, Yaorochi in constantly annoyed at their carefree attitude and lack of discipline. Yaorochi is in bad terms with other Mugenri-natives, having been isolating themself until meeting Sukune and the events of Earthen Miraculous Sword. Yaorochi chooses not to socialize with them and looks down on humans. ↑ This is referencing the origin of the Kusanagi sword, which was found inside one of Orochi's tails. ↑ This is a reference to Ame no Habakiri, a sword which Susanoo used to kill Orochi. ↑ Doguu are ancient clay figures. ↑ Kusanagi, or "grass mowing", short for Kusanagi no Tsurugi, or "grass mowing sword". The other versions of this card are variations on this name. ↑ A variation on Yaorochi's bomb and final card in Earthen Miraculous Sword. Their name has the kanji for "eight tails", but in artworks, they have seven tails. They also have a spell card called "Seven Tails". Since they have seven siblings and they're supposed to be the head of the family; this implies that they aren't precisely the oldest. Yaorochi's and Saragimaru's color schemes are inverted in Reactivate Majestical Imperial. According to JynX, they're only powerful when they're using the Tasouken. They're also not so aloof and dignified as they pretends to be. Yaorochi's seven tails can change their thickness and length at will, though this hasn't been written in anything. This page was last edited on 13 November 2018, at 09:48.